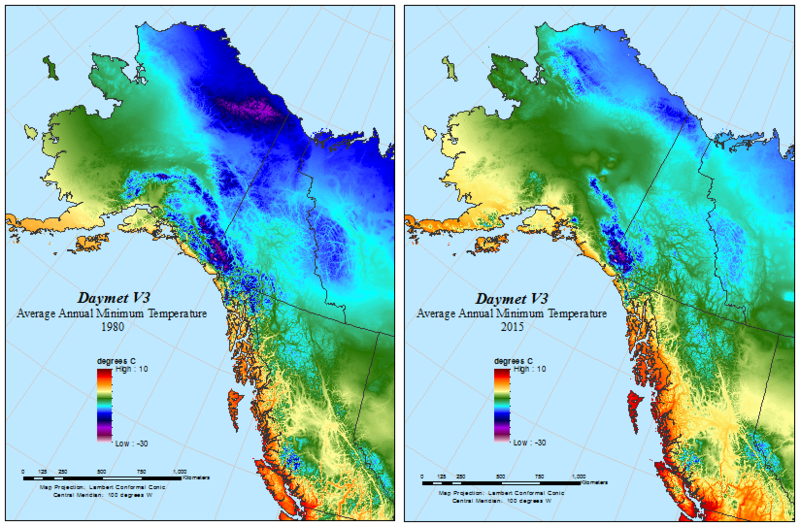 Daymet V3 average annual minimum temperature for 1980 and 2015 for a subset of the Daymet domain in Alaska and western Canada. These datasets provide Daymet Version 3 monthly and annual summary climatologies at a 1-km x 1-km spatial resolution for four variables; minimum and maximum temperature, precipitation, and vapor pressure. Monthly or annual averages are provided for minimum and maximum temperature and vapor pressure, and monthly or annual totals are provided for the precipitation variable. The climatology summaries are derived from the much larger data set of daily weather parameters (Thornton et al., 2016), produced on a 1-km x 1-km grid over North America including Canada, the United States, and Mexico. Separate summary files are provided for the land areas of Hawaii and Puerto Rico, which are also available as gridded daily files as part of the Daymet V3 data set. Data are in a Lambert Conformal Conic projection for North America and are distributed in a netCDF file (version 1.6) format compliant to Climate and Forecast (CF) metadata conventions and geotiff file formats.